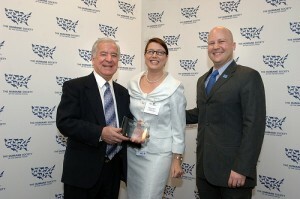 Representative Rahall accepts his Legislative Leader award from Nancy Perry, Vice President of Government Affairs for The Humane Society of the United States, and Michael Markarian, President of the Humane Society Legislative Fund. Well, Rahall is chairman of the House Natural Resources Committee, which oversees public lands and a variety of environmental matters — everything from fisheries to, yes, enforcement of the 1977 federal Surface Mining Control and Reclamation Act. And among national environmental groups, Rahall is not only considered a pretty reliable vote, but also a leader on many issues those groups care about. Consistently, Rahall votes nearly three-quarters of the time with the “pro-environment” votes ranked by the League of Conservation Voters. At the same time, Rahall’s 3rd Congressional District of West Virginia makes up the heart of the state’s southern coalfields, the area where most of the big mountaintop removal has and is going on. And Rahall has supported mountaintop removal, though he has sometimes been critical of certain permitting practices, since as the failure of agencies to come up with a clear definition of approximate original contour or enforce post-mining land development requirements. And since I wrote that last October, the political situation for Rahall certainly hasn’t gotten much better. He now has top Friend-of-Don-Blankenship Spike Maynard running for his seat, and Maynard is making this nonsense about Washington’s “War on Coal” a major issue. Rahall doesn’t seem willing to step up — as Sen. Robert C. Byrd has done — and provide West Virginians with some honest talk about the tenuous future of the Central Appalachian coal industry. Instead, he’s reduced himself to urging Massey Energy to run its pro-coal ads in Washington, D.C., to help convince lawmakers and other policy leaders there how great the industry is. It’s not so surprising, given the politics and economics of his district, that Rahall hasn’t come out publicly against mountaintop removal coal mining. Still, Congressman Rahall is a smart guy with a smart staff, and he’s in a position — despite his support for coal — to make this industry be a far more responsible corporate neighbor in the region he has represented in Congress for more than three decades. | Call in Interior Secretary Ken Salazar and OSMRE Director Joe Pizarchik for a committee hearing, and demand to know why they haven’t yet started writing a tougher and more clear definition of the approximate original contour reclamation standard. And if the Obama administration won’t take on the task, Rahall and his committee could put forward legislation to do it themselves. | Haul some coal executives — maybe he could start with Blankenship — before his committee and ask them to explain why so few flattened mountaintop removal sites are being developed for new businesses or other community assets. | Schedule another hearing with Salazar and Pizarchik, and demand to know how in the heck OSMRE is going to accomplish the tougher enforcement oversight it has promised given the budget cuts proposed for the agency by President Obama. | And, while Rahall may not support the Obama administration’s proposal to stop spending money meant for abandoned mine cleanups on other projects, shouldn’t the Natural Resources Committee at least give the issue a full hearing so lawmakers are educated about the matter? | Gosh, while Rahall has Salazar in a committee hearing, he might ask the Interior Secretary to explain how his agency continues to defend a sweeping 1996 “biological opinion” that says no coal mining operation anywhere would ever harm a threatened or endangered species. | Rahall could start asking EPA and OSMRE some tough questions about why state agencies like the WVDEP are allowed to keep giving coal companies extension after extension to come into compliance with water quality limits for stuff like toxic selenium. He might ask why OSMRE and EPA let the WVDEP go for years without even bothering to look at discharge monitoring reports from coal-mining operations, and take testimony on whether enough has been done to fix that system since the EPA’s $20 million settlement with Massey. And to be clear here, I’m not talking about a throw-away question during a budget hearing that deals with dozens of other issues … coal-mining’s environmental and community impacts are the biggest issue facing Rahall’s district — and if you consider the global warming pollution from coal in there, almost certainly the biggest environmental issue facing the country. These matters could be major investigative hearings in which Rahall and his committee could educate the rest of Congress and the American public. Maybe he could start by scheduling just one little hearing, in which the authors of the Science journal article that found mountaintop removal’s environmental effects to be “pervasive and irreversible” could come in and testify about their findings … Congressman Rahall could even invite the coal industry to bring its own experts, and press them to explain what data or research they have to show that study is wrong. Those guys from Massey with the “Nick Joe is Anti-Coal” signs aren’t voting for Congressman Rahall anyway … so what does he have to lose? The coal-rich mountains of Central Appalachia are home to generations-old communities, and contain beautiful hollows through which thousands of miles of pristine and ecologically rich mountain streams flow. Mountaintop removal has already transformed huge expanses of one of the oldest mountain ranges in the world into a moonscape of barren plateaus and rubble. Future generations will not forgive us for what we are now doing to the Appalachian mountains. All right. Mr. Lovett, everybody we have heard from so far today seem to be the most negative of everybody. I mean, you state our future generations will not forgive us. You know, I take that as an affront. I go to bed at night and sleep soundly, and I think I am doing all I can to protect our environment and provide for jobs. But there is an insinuation there that I am not. Sen. Byrd has urged other public officials to be “honest brokers” about the looming issues facing the coal industry, and made it clear that he will represent the interests of all of his constituents, not just the vocal and strident supporters of mountaintop removal. Environmentalists and coalfield residents have a right to wonder when Nick Rahall is going to start following Sen. Byrd’s advice. I can’t believe you or Jeff Biggers are so politically naive as to really believe Rep. Rahall can take the steps you outline above and still be re-elected. Well, maybe I can believe that about Jeff. You outline a clear path to victory for Maynard or another of his ilk. And then what? Can you possibly think some like Spike will be more willing to listen? You ask, “what has he (Rahall) got to lose?” I would submit that we all have a great deal to lose if Nick isn’t there. Rahall may not take every step that some may want, but to lose him at this time is to lose that seat for a long time. OSM has decreased its oversight inspection staff by two-thirds and the inspections by even more than that much. Recently, OSM published the number of its “active oversight inspectors” as being 47 — by my count from the OSM inspection database itself that number is 27. The Ohio State Regulatory Program conditionally approved in 1982, still remains so snce one of those conditions — demonstrated the adequacy of its Alternative Bonding System to perform timely reclamation on bond forfeited coal mining operations — still remains to be satisfied three decades latter. The OSM annual evaluation reports of the state programs show the same non-compliances of SMCRA requirments continuing year after year after year. There are sites in many states that were mined under SMCRA permits which have been left unreclaimed forever mostly due to performance bonds that where insufficient and/or issue by sureties that became insolvent. OSM does bother to keep track of such sites even though it has a directive that requires such tracking — maintaing inspectable units inventories. It’s not just Mountain Top Removal coal mining that’s over looked. SMCRA itself has been trampled while its sole remaining original champion has watched it happen. The biggest travesty to me is that some mining companies are made to do what others are allowed (or even approved) to not have to do. The real injustice is that fairness and consistency were suppose to be mainstays of that 1977 federal act. I fully agree with Phil Smith that Congressman Nick Joe Rahall is among the great ones. This year is a tremendously difficult one for anyone seeking re-election and great ones very much need to be supported. Feel free to call me politically naive or whatever you’d like. As I think my post reflected, I have great respect for Congressman Rahall, and I tried to explain the difficult political position he is in on this issue. I’m not sure how well you really know that district, or whether you’ve actually examined the election returns. He regularly wins by a 2-1 margin. He hasn’t come anywhere close to being beaten since 1990. I would ask you to provide publicly here on Coal Tattoo any polling or survey data you and the UMWA have which would indicate that any of the above actions by Congressman Rahall would be politically unpopular with a majority of registered voters in his district. If you look at the district, and at the five biggest coal producing counties — Boone, Logan, Mingo, Raleigh, and Fayette — Rahall last time around got more than 70 percent of the vote in all but one, that being his home county of Raleigh, where he got 60 percent. In his Supreme Court race, only one of those counties — his home county of Mingo — was one where Maynard did especially well compared to his statewide figures. Despite all the noise about Maynard’s campaign, this doesn’t suggest a particularly strong challenge to a long-time and very politically popular congressman. Do you really think, Phil, that coal miners working for Massey Energy are going to go vote for Nick Rahall, given how much noise their employer is making on this? What is just as likely is that his terribly unbalanced public position (and private actions) on mountaintop removal is more likely to get other folks who care about that particular issue to just stay home. Frankly, I think you’re the one being a bit naive to think otherwise — and I fail to see how any of the specific steps I’ve listed is going to lose Nick Rahall a single vote that he hasn’t already lost. I mean, come on, Phil — it’s fine for your knee-jerk reaction to be to defend the UMWA’s longtime friend in the West Virginia 3rd. But how exactly would it cost Nick Rahall votes to do have a hearing on whether we should stop sending AML money to western states that have cleaned up all their abandoned coal mines and instead put your laid-off members to work doing more AML cleanups in Southern West Virginia? How would it cost Nick Rahall votes if he insisted that the next big Massey Energy mountaintop removal permit include a plan to build a furniture factory on the flattened land, to put folks in Boone County to work when the coal is gone? These are hardly radical ideas … they are simply proposals for taking a more balanced position on a major issue facing our state and Congressman Rahall’s district, and you haven’t provide a detailed criticism of any of them or any evidence to suggest that taking them would hurt Congressman Rahall politically at all. Great piece Ken. Let me know when you want to run for congress and I’ll volunteer for your campaign! If you can you show us an independent poll that shows the “majority” of WV is against MTR I would like to know the details of the sampling. I’m not talking about a poll of Gazette readers, or a poll conducted in the northern panhandle. Secondly, has anyone conducted a poll of people living south of Charleston regarding support of MTR. I’m not suggesting the opinions of people from Wheeling and Moorefield don’t matter, but let’s face it all they know about this issue is what they read. I think that is a great idea Josh. Ken Ward, Jr. for congress. Sounds great. I would certainly vote for Ken, and volunteer to work in his campaign. Keep up the good work Ken. I’m aware of several publicly available polls about mountaintop removal going back several years. We’ve posted these before — several times, in fact — but I’ll run through them again for you. As I said, these are statewide. I would be interested to see more localized data — such as by congressional district — but keep in mind that such more localized polls can be more subject to larger margins of error, and thus less accurate. — A “West Virginia Poll” conducted by Ryan McGinn Samples in April 1998 found that 52 percent of those surveyed opposed mountaintop removal. This poll was conducted for the Charleston Daily Mail and WSAZ TV. I do not have the questions or the detailed data from it. — Another West Virginia Poll conducted by the same organization for the same media outlets in October 1998 found that 53 percent of West Virginians surveyed opposed mountaintop removal. That last survey — Mark Blankenship Enterprises did not reveal who asked for or funded the survey, and did not provide much more information beyond that one question (compare the information this firm released to what was released by Celinda Lake, for example). Obviously that last poll showed a result very different from the others. But because not much information is available about what other questions were asked, it’s hard to make much of a call as to how valid the survey is or why the result was so different. On the other hand, it’s possible that the newer data is more accurate. But, I have more frequently cited the other polls for two reasons: First, the first two were conducted for news organizations (not the Gazette) and perhaps less likely to have questions that were pushing those surveyed in one direction or the other; and Second, because Celinda Lake released much more detail on how the poll was conducted and what questions were asked. I’ve asked Mark Blankenship for more data on his survey — such as a list of the questions — but he has never responded to my request. While a majority of West Virginians say they have heard little or nothing about mountaintop removal coal mining, more than half say they are opposed to it. Mountaintop removal, in which mining companies use dynamite and enormous shovels to remove the earth covering coal seams, has come under fire recently for altering the landscape, damaging nearby houses with blasting and causing unknown damage to streams covered by rocks and debris. Sixty-three percent of respondents to the West Virginia Poll said they had heard very little or nothing about mountaintop removal and surface mining. A third of respondents said they had heard some news or a lot about mountaintop removal and surface mining. The same poll found that 52 percent of respondents opposed mountaintop removal mining. Thirty-two percent favored the method of mining coal. The West Virginia Poll is conducted for the Daily Mail and WSAZ Ne wsChannel 3 by Ryan McGinn Samples Research Inc. Telephone interviews were conducted between April 27 with a random sample of 402 West Virginia residents. The margin of error is plus or minus 4.9 percentage points. An environmentalist and an industry spokesman disagreed about the meaning of the results. Cindy Rank, chairwoman of the mining committee of the Highlands Conservancy, said it was a big improvement if a third of respondents had heard news about mountaintop removal mining. “I think that’s much higher than you would have heard two years ago,” she said. “We were writing about it in ’95 and ’96 and there was no interest whatsoever because people didn’t understand what was going on.” Those who don’t live near mine sites probably hear less about it than people who do, Rank said. But as people learned more about mountaintop removal, opposition has grown, she said. “People who have been exposed (to mountaintop removal) are probably among those 52 percent who say they’re opposed,” Rank said. “If anybody has been exposed to it up close and personal they would be appalled, or opposed.” Ben Greene, president of the West Virginia Mining and Reclamation Association, said the number of people opposed to mountaintop removal reflects a poor understanding of the process. “The mountaintop removal information of recent vintage seems to be unclear,” he said. As an example, Greene said it was unfair to use active mining sites to illustrate mountaintop removal. “The biggest complaint I have is every picture I’ve seen is of an active operation, not the reclamation process or the return to a stable and active use,” he said. When the public sees photos of unattractive active mining, it’s a “normal reaction” to be opposed to it, he said. “If I see a picture of a train wreck, I’m not in favor of trains.” On another issue, poll respondents ranked health care over mining and chemical manufac- turing as industries important to the growth of the state’s economy. Eighty-four percent of respondents said the health care industry was very important, while 67 percent said travel and tourism was very important. Coal mining was ranked very important by 63 percent of respondents, and chemical manufacturing was considered very important by half of respondents. Poll respondents also listed littering and dumping trash as one of the biggest environmental problems in the state. That’s because people come in contact with that problem most frequently, Rank said. As more West Virginians become aware of issues surrounding mountaintop removal mining, a majority remain opposed to the large-scale strip mining method, a poll shows. More than half of respondents to the most recent edition of The West Virginia Poll, 55 percent, said they had heard “a lot” or “some” news about mountaintop removal. Only 35 percent of those who responded to a similar question in May said they had heard “some” or “a lot” of news about mountaintop removal. In the current poll, 53 percent said they oppose the practice, up slightly from the 52 percent who expressed that opinion in May. On a related issue, a majority of respondents opposed the involvement of churches in political issues. Gov. Cecil Underwood has criticized state Methodist church officials for taking a stance against mountaintop removal mining, saying the church should stay out of political issues. Fifty-three percent of poll respondents opposed church involvement in political issues, while 38 percent favored their involvement. Nine percent expressed no opinion. As for mountaintop mining, two-thirds of respondents said regulators should either ban it or reduce the number of permits. Those who favor mountaintop removal made up 29 percent, compared to 32 percent in May. Another 18 percent said they didn’t know or didn’t have an opinion. That segment made up 16 percent of respondents in May’s poll. The West Virginia Poll is conducted for the Daily Mail and WSAZ NewsChannel 3 by Ryan McGinn Samples Research Inc. Telephone interviews with a random sample of 406 West Virginians were conducted Oct. 19-21. The margin of error is plus or minus 4.9 percentage points. Mountaintop removal mining involves the use of explosives and enormous shovels to remove rocks above and between coal seams. Leftover rock is piled in valley fills, which sometimes cover streams and may cause problems downstream. Ben Greene, president of the West Virginia Mining and Reclamation Association, said a recent advertising campaign may be responsible for the increase in the number of people who have heard something about mountaintop removal. Arch Coal has taken out full-page ads in newspapers around the state based on the theme that mountaintop removal is “the right thing to do.” TV ads supporting mountaintop removal also have appeared. Thirty-eight percent of poll respondents said regulators should reduce the number of mountaintop removal permits, while 28 percent said they should ban the mining technique. A fifth of respondents said the practice should be allowed to continue as it is now. Greene said the numbers indicate that people want a compromise on the practice and discounted the number who want to see mountaintop removal banned. “It would seem to me that’s the basic environmentalist extreme argument and those (people) would not want you to cut a tree, mine coal, build a road or build a factory,” Greene said. “There’s no use to direct a message to them because they have a fixed position already,” he said. Cindy Rank, a leader of the Highlands Conservancy, disagreed, saying the poll showed a significant number of people against mountaintop removal. “Not only are people opposed, they’re saying ban it,” she said, noting that public opinion has remained constant through a stream of coal industry ads. “Sixty-six percent of people think it’s too much.” “Among the people that are asking for bans are some of the religious groups,” she said. “I don’t consider them “aginners.’ ” Several church groups have called for a ban on new mountaintop removal mines until more is known about the effects on people and the environment. Gov. Joe Manchin and the state’s congressional delegation are sure to get an earful today when they meet with a herd of coal company executives and elected officials from coalfield counties. But what do most West Virginians think about the ongoing debate over fighting global warming, reducing the impacts of mountaintop removal and moving toward cleaner production of energy? Let’s put our cards of naivete on the table. Many other reports, as you know well, have spelled out the dwindling future for coal production. Instead of waiting for more layoffs and economic uncertainty and despair, we all know it’s time for a “just transition” in the coalfields to sustainable jobs and a diversified economy, and it’s time for the Appalachian coalfield communities to get their “fair share” of the massive clean energy investments and job initiatives taking place in the rest of the country. You know what happened to my coalfield region of southern Illinois–we followed the boom-bust single economy driven by outside coal companies for over 150 years, and then watched our unions gets busted, the companies abandoned our towns, our jobs and property values dried up, and our communities and stripped woods and farmland were left in ruins. Southern Illinois should be a cautionary tale for naivete in the Appalachian coalfields. This is what I believe and have written many times: Every coal miner deserves a right to a sustainable livelihood; given the legacy of our coal miners such as my grandfather and many relatives, and I believe no coal miner should be displaced from his or her job until we develop clean energy alternatives. This means that coalfield residents, like all Americans, deserve a road map for a feasible transition to clean-energy jobs — including a Coal Miner’s GI Bill for retraining and a massive reinvestment in sustainable economic development in coalfield communities — before we reach a point of no return. This means Rep. Rahall should be fighting for more more more clean energy jobs and massive clean energy investments in manufacturing, reforestation, weatherization programs, and clean energy production. All coal mining communities know that the first time in 25 years, utilities coal stockpiles have increased during the summer; absentee coal companies are cutting jobs and idling higher-cost mines to keep their stock holders happy in a period of slumping demand; recent U.S. Geological Survey estimates place “peak coal” production as early as 2020. I believe coalfield communities–and coal miners–deserve to be in the forefront of change. Wow!….Some rather tough rhetoric here! (“politically naive” – “knee-jerk reaction”)…….I once said that Celeste Monforton from The Pump Handle was “misinformed” and got called to Ken’s woodshed!…Again, your blog – your rules I guess. At any rate, my hopefully germaine comment is that I feel Mr. Ward is vastly underestimating Spike Maynard’s appeal and competitiveness in District 3. VASTLY!…. (oops – didn’t mean to shout). I don’t think Spike has much of a chance, but so far this looks to be a very fluid election. The economy seems to be improving a bit, which is good for incumbents. But it’s not exactly glorious out there. Although the high degree of conservative agitation and the low level of liberal interest both seem to be easing toward the middle, there is a real possibility that a hot button issue could bring a lot more cultural conservatives (like those in S WVa) out to the polls. So my take is that for Rahall, the more time spent talking about health care and the less time spend talking about the environment the better. That may change after a few things happen (all of which I expect) 1. Health Care passes. 2. The unemployment rate drops by a point or two 3. the bailouts are largely paid back. Those would give a Democratic incumbent like Rahall room to move on other issues. But those may not all happen for several months, and he might not feel empowered to take on anything potentially unpopular until after November. Mr Biggers….You fail to mention that the Southern Illinois Basin is experiencing quite a renaissance and retooling of their coal industry (see Cline Resource & Development Company – founded by Wyoming County native Chris Cline w/ principal offices in Beckley & West Palm Beach, FL…..). Unfortunately Southern WV will never see this resurgence due to depletion of lower cost reserves. (I actually agree w/ the work done, @ least on reserve depletion, by Rory McIlmoil et al). As more & more SO2 scrubbers @ coal-fired power plants are deployed, sulphur becomes less and less of an issue. It all boils down to delivered $$$/MMbtu. Period. Funny how these things seem to work in a capitalistic society. While I’m not sure I see, in the words of VNXQ809, “Spike Maynard’s appeal,” his competitiveness in District 3, as in most political contests, may come down to money. And anyone with a short-term memory knows that his buddies at Massey Energy can be remarkably generous when it comes to West Virginia elections. That generosity can buy a lot of airtime directed, not at people who attend rallies, but at voters who don’t focus on the issues until the weeks just before Election Day. To suggest otherwise is… well, naive. Bingo, D Kameras! !….Not only his buddies @ MEE but friends w/ $$$ @ ANR, CNX, & PCX…..All large employers in Rahall’s district….As they say down home you can make a silk purse from a sow’s ear w/ enough $$$. Maybe “appeal” was a poor choice of words. Forgot to mention ICG – no slight intended to loyal troopers like Kitts, Nicholson & Hatfield. I rest my case, how can you be opposed to something you know little to nothing about, unless the poll questions lead you that way. Yeah, the power of coal money explains why Blankenship won all those legislative races he backed in 2006. For the irony impaired, yes, that was sarcasm. In case anyone doesn’t know, Phil Smith and D (as in David) Kameras are both media spokesmen for the United Mine Workers union. Coal Tattoo readers certainly know Phil, but I’m not sure everyone knows David’s name. Perhaps David can point to exactly what among my list of things Congressman Rahall could do is likely to cost the votes of Southern West Virginians. Wouldn’t folks in Congressman Rahall’s district like to see more money spent here in AML cleanups? Wouldn’t they favor putting new businesses on top of land flattened by mining? Wouldn’t they favor forcing coal companies to comply with existing water pollution limits? concerned miner — I think you’re not really addressing the whole picture of those polls when you pick out just one sentence about the oldest of them (April 1998) to cite … if you look at the 2004 poll questions, the picture is much different. Irony impaired!….Very witty, drh……not lost @ least on this blogger!….Good point – but as I mentioned more than likely other companies will open their checkbooks a little more freely for this race…. drh raises a good question — how would either of you respond? Does the UMWA have such little faith in its members, their families, and their communities as to believe misleading advertisements are going to sway them to vote contrary to the union’s advice and endorsement? My big concern this November is whether or not voters not wearing an “I Like Spike” button or Massey logo can even make it to the polls. Charleston police couldn’t or wouldn’t protect citizens trying to attend the Oct. 13, 2009 US Army Corps of Engineers public hearing on NWP 21. If you weren’t wearing stripes, a Massey logo, or Friends of Coal logo, you were subjected to a barrage of insults, harassment, and threats. How will the local and state police ensure the safety of citizens wanting to vote if little squads of large angry people show up at/near polling places? Chris Hamilton’s lukewarm comments about “general thuggery” don’t seem strong enough to discourage this sort of behavior, Massey isn’t compelled to agree with the WV Coal Association, and the UMWA still hasn’t made any comments about the violence, in spite of our meeting with a UMWA representative and Gov. Manchin on Jan. 24. The $100 fine imposed for the woman found guilty of battery for hitting Judy Bonds June 23 and the $100 fine for the man found guilty of verbal assault threatening people at a July 4 picnic don’t discourage that sort of behavior. Massey doesn’t behave as if they’re compelled to obey federal safety and environmental laws, so why should voting laws be any different? They’ve got enough money, angry miners (employed and laid off), and attorneys to significantly affect the coalfield vote for this race or any others they choose to interfere with. My comment didn’t get posted yesterday due to my refernce of a burning place that was a 4 letter word. So here we go again. Mr. Rahall is going to be out this election. That is a prediction I know but he is not doing enough for the industry and staying silent on MTR, for the most part. It is a political move but if you want to know what Nick Joe thinks about coal, then look at his votes. He voted against cap and trade this is true but only after he was given permission to by Peolsi. He was terrifed was what a local politician that has ties to Rahall told me. He knew if he voted yes then he would be definately out so he waited until his “no” vote wouldn’t matter. Anyway, we all know that coal is our life’s blood here in the south and the state. I am a deep miner and make over 100 k as a foreman. My equipment operators make somewhere in the 70k area. If the state or the feds would bring some alternative form of energy that would do as much for this country that coal has. Be honest, this country runs on coal, even Congress warms up during the mornings on a coal fired plant, Al Gore uses more electricity than most Americans do. If they really are serious about the extinction of the coal industry, then put into place something that we can maintain our current lifestyle. I live in the other West Virginia, the one below the Kanawaha River. This state acts like there are two WV’s anyway. Kirkindall gave an interview in the Logan Banner once that stated only 4% of the mountains are effected by MTR. If seems kinda odd to me that if we blast a mountain away to create a golf course or an airport then it is called development, but if we blast away and use the coal, then reclaim the area for wildlife, then it is destruction. Have any of you ever looked at a reclaimed mine? It is beautiful. I hunt sometimes on a reclaimed mine site and the area is pristine, and bounding with wildlife. I have never worked on a strip but I have hunted the reclaimed area. Look guys give us an alternatives and we may listen, but all we are hearing down here is the destruction of jobs ( that goes along with the Obama admin). Soooo, until we get some options, then lay off our backs, we use them to work and produce the energy you sooooo enjoy. Mr. Browning – you are free to “blast away,” as you put it, as long as you follow the law while doing so. And that is something that NO coal company has been willing to do for the last 150 years in this state, with the active collusion of politicians and the apathetic non-enforcement by state regulatory officials. So until the coal companies are willing to start listening, those who are no longer content with the “business as usual” attitude are going to keep talking. It might behove both sides to start listening a little instead of shouting at each other. The fact that Nick Rahall received the Humane Legislator of the Year award from the Humane Society does nothing to burnish his environmental credentials. Wild horses and burros have done a great deal of damage to the public domain and compete with wildlife for scarce grazing resources. This means less elk, bighorn sheep and deer, damage to streams and aquatic wildlife and defoliation of native plants. Environmentalists are often confused with animal rights activists, but on this issue every conservationists I know supports removing feral horses and burros from public lands. The same goes for the very popular legislation to end the exporting of horse meat, which creates an unfair burden on ranchers who need to get rid of horses that are to old to be productive. Wouldn’t it be better to let the French eat them rather than send them to a land fill? I find the Humane Society’s bias against native plants and wildlife in favor of these very destructive animals to be anything but humane. Remember, the Humane Society is even opposed to fishing! The joker in the deck for this November is the Citizens United decision recently handed down by the Supreme Court of the United States. I, for one, don’t think Don Blankenship is a moron. I think he likely learned that he and his money are most effective when used in a single race (like Benjamin), as opposed to a broad spectrum approach he used to no gain the following election cycle. As such, if Blankenship devotes his now-unlimited money to beating Rahall, and encourages his comrades to do the same, then I’d say Maynard has a better than average chance of unseating our incumbent congressman. Rep. Rahall apparently hasn’t yet figured out that he can NEVER be pro-coal enough to suit the industry. Where the coal industry is concerned, there’s no such thing as too obsequious, too fawning, too slavish. By throwing Rahall under the bus, they prove my point. Given Rep. Rahall’s bragging remarks about having stopped legislation that would’ve ended Mountaintop Removal, it’s clear he holds open disdain for those of us who support an Appalachian Renaissance that begins with the end of the most destructive, toxic coal extraction process ever conceived by the human mind. The thousands and thousands of West Virginians who opposed Mountaintop Removal aren’t worthy of our congressman’s attention. With all of the foregoing as background, it seems obvious to me that we who would end Mountaintop Removal are better off with Maynard, who will be a freshman, impotent, ineffective member of the minority, as opposed to Rahall’s continuing ferocious opposition to anything that will help West Virginia have a decent, just transition to a clean economy in the foreseeable future. My questions: does Blankenship know this, too? If he does, is he simply using Spike as a stalking horse to strongarm Rahall? Does Spike know he’s being used in such manner? If he does, is he comfortable with such a role?